The Nomad LITE is a mobile podium with microphone and speaker that was created to provide a simple solution to support the delivery of basic presentations or speeches. The LITE easily turns any room, hall or foyer into the perfect venue for hosting press conferences or other public address events. The LITE provides a voice amplification system in a space where there is no other existing audio infrastructure. The microphone and speaker allow a user to keep the entire audience engaged with his/her voice. The LITE is an affordable mobile podium with microphone and speaker that includes options. It was designed to meet basic public address needs. The limited functionality and flexibility of the LITE is reflected in the entry level price point. The LITE creates temporary public address settings out of any ordinary space. Four sturdy wheels allow the mobile podium to be easily re-purposed or returned to storage at a moment’s notice. The speaker built into the LITE directly faces the audience to provide focused audio delivery. Amplifies the presenter’s voice to be heard by the whole audience. Two swiveling and two fixed wheels provide exceptional control of the LITE when moving between rooms. It can also be easily stored when not in use. Allows the mobile podium to stand alone without existing audio infrastructure. Includes connections, located on top of the lectern, for a notebook computer or other personal devices . Flip-up shelves create plenty of workspace and are easily released and folded to save space when not in use. Connects to your output display(s) wirelessly and eliminates having to worry about TV/projector placement or the need for unsightly cable runs. Two doors close off the open face of the mobile podium to improve appearance and allow for storage. 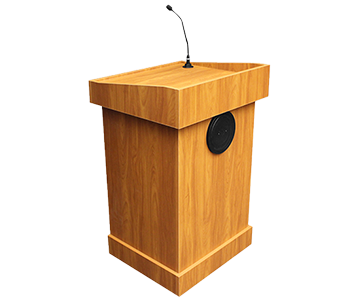 With hundreds of wood grains, colors and patterns available, the mobile podium (with microphone) is sure to match the interior design of your space. A custom-engraved wood plaque can be fixed to the mobile podium to prominently display your organization’s logo.